Thank you so much to Mark and Elaine who sent this card from their trip to Borneo. 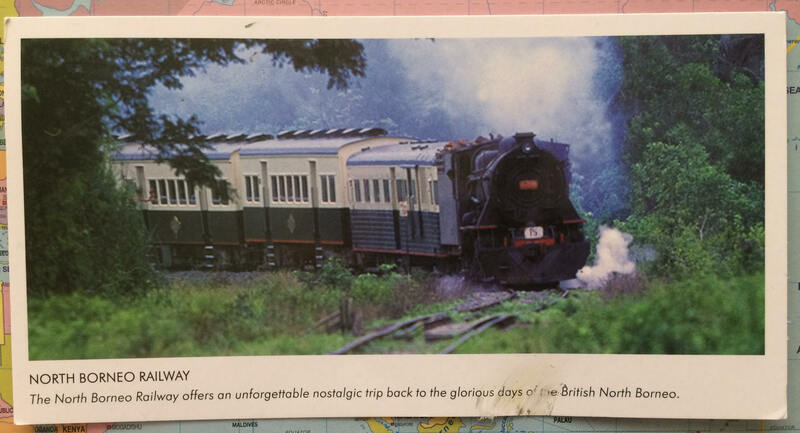 The picture shows a beautiful steam train of the North Borneo Railway of Malaysia. Mark and Elaine told Geography Cat the journey was very hot indeed, and they enjoyed a tiffin breakfast and lunch; sounds lovely. This area of the island of Borneo is called Sabah, previously a British Protectorate it was occupied by Japan during World War II, becoming part of Malaysia in 1963 despite a territorial claim by the Philippines. Control of the area is still hotly contended, the most recent conflict happening in 2013, known as the Lahad Datu standoff, or incursion. The island of Borneo is the third largest island in the world, divided between three nations; Indonesia, Malaysia and Brunei. It is spanned by the Equator and home to rain forest estimated to be around 140 million years old. Deforestation is a threat to indigenous species and the quality of life of Borneo people. The current cause of deforestation here is to make way for palm oil plantations, a threat to species who may not even have been discovered and studied yet. See the WWF for more information.